The Ran (Ran-related or Ras-like nuclear) protein is the single member of the Ran subfamily, and the most abundant small GTPase in the cell. Like the other small GTPases, Ran functions as a molecular switch, converting between the active GTP-bound and inactive GDP-bound conformations. Ran is soluble and mobile throughout the cell, therefore its spatial location is determined by the cellular position of Ran regulators RCC1, the major Ran guanine nucleotide exchange factor, and Ran GTPase activating protein (RanGAP). Ran interacts with RanGAP in the cytoplasm, and with the chromatin-associated RCC1 in the nucleus. 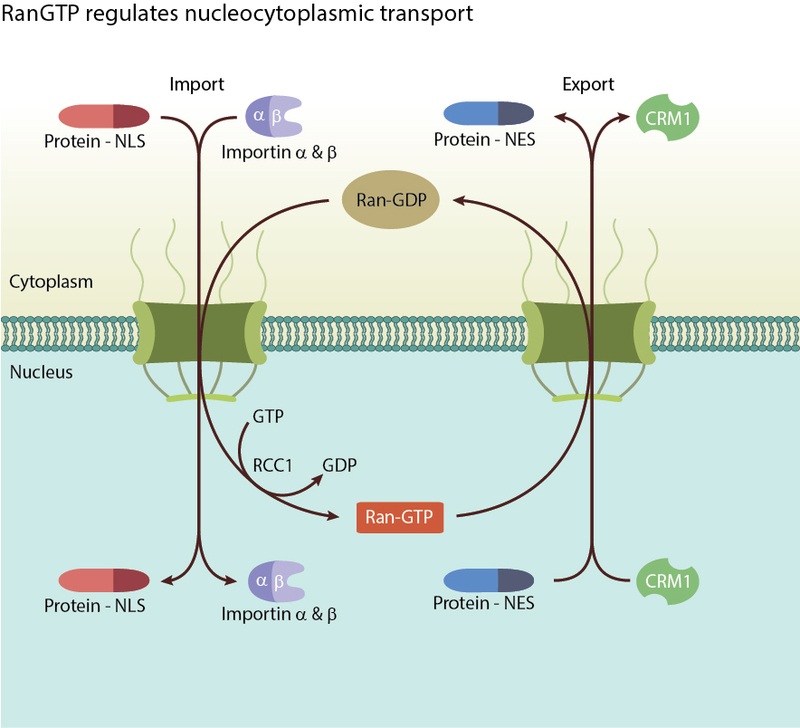 The specific location of these regulators creates a Ran-GTP gradient within the cell, with the net result of concentrating active Ran in the nucleus . RanGTP activity drives import and export of RNA and proteins through the nuclear pore complex. This concentration gradient underpins the major function of Ran, the regulation of nucleocytoplasmic transport of RNA and proteins through the nuclear pore complex . While molecules smaller than 40kDa are able to diffuse freely across the nuclear membrane, larger molecules and mRNA require carrier proteins named karyopherins to facilitate energy dependent nucleocytoplasmic transport. Karyopherins are either responsible for nuclear import (importins) or export (exportins). During nuclear import, an importin-α/β heterodimer forms a complex with cytoplasmic proteins tagged with a nuclear localisation sequence (NLS) and transports the proteins into the nucleus. Inside the nucleus, the high concentration of Ran-GTP rapidly binds to importin-β to dissociate the complex, releasing the transported protein, followed by recycling of the importins back to the cytoplasm. Conversely, during nuclear export, Ran-GTP binds and forms a complex with exportin and the protein to be transported out of the cell. Once in the cytoplasm, RanGAPs hydrolyse Ran-GTP into Ran-GDP, dissociating the complex and releasing the transported macromolecule . Aside from nucleocytoplasmic transport, Ran has also been implicated in a variety of other cellular functions. During mitosis, microtubules assemble into a mitotic spindle for correct chromosome alignment and separation into the two daughter cells. Disruption of the Rans or the regulator RCC1 leads to impaired mitotic spindle assembly or improper alignment of chromosomes on the spindle . Further studies revealed that during interphase, spindle assembly factors (SAFs) are targeted to the nucleus via NLS and importin-α/β complex. However, SAFs are inactive when bound to the complex, and become activated only after dissociation by Ran-GTP . The mitotic spindle is disassembles after mitosis is finished, followed by formation of the nuclear envelope around chromatin. Ran has key roles in the formation, structure and function of the nuclear envelope, although the mechanisms that direct this are still unknown. However, it is thought that RCC1 generates Ran-GTP in the vicinity of chromatin, where it recruits nucleoporins through importin-β for NPC formation, followed by vesicle recruitment and fusion to form the nuclear envelope, and commencement of nucleocytoplasmic transport . 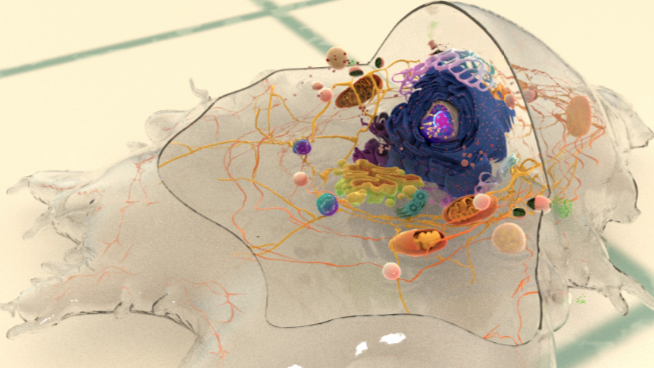 Recently, a number of studies have revealed new roles for Ran in the cytoplasm of large post-mitotic cells, namely neurons and megakaryocytes. Knockdown of Ran in neuron cultures resulted in excessive axonal branching and increased blebbing, suggesting that Ran may regulate neurite outgrowth. In damaged axons, the Ran effectors RanBP1 and RanGAP are upregulated, and they facilitate Ran mediated retrograde transport in response to injury . High, tissue-specific expression of Ran is linked to tumourigenesis in renal and ovarian cancer. In human pancreatic cancer, Ran overexpression correlated with tumour staging and suppression of Ran in pancreatic cancer cell lines led to a suppression of cell proliferation and an increase in apoptosis . Legionella bacteria can hijack the Ran GTPase system to enhance infection. Activation of Ran by the legionella protein LegG1 stabilises microtubule polymerisation and enhances migration of infected cells .